right 2015 by J. Alan Wall. All rights reserved. A rather unusual sign-off clip, which has images of rockets superimposed over the KWHY-TV 22 ID card, then followed by a brief "America The Beautiful" segment with historical images. During the late 1970s and throughout the 1980s KWHY-TV aired business and financial news in the morning and afternoon hours and the Pay-TV fare of SelecTV in the evenings, hence the announcement at the start of this clip. This southern California-based Pay TV network (no relation to the current SelecTV based in Australia) operated from 1976 to 1991. There had been several incarnations of Channel 22 in Los Angeles.  The first was KBIC-TV, which from 1954 to 1962 telecast a combination test pattern/station ID slide, and nothing else. The second was KIIX-TV in 1963, featuring programming geared for an African-American audience, but went dark the following year. In 1965 Channel 22 returned to the air as KPOL-TV as a typical independent station. The station changed hands again in 1966, taking its current calls KWHY-TV as the result. Today's Channel 22 features primararily programs in Spanish.